For over a month since I started doing japam (recitation of a mantra using a rudraksha necklace), I have been curious about which mantra to say. Having read Hilda Charlton's Book, Skanda, I was blessed to have been bestowed with two powerful mantras gifted by Lord Skanda, Himself. Hence, realizing that they were both very important, else Skanda would not have disclosed them to Hilda, I began to chant one mantra for one day, and alternate with the Jyoti-Mantra the next day. But, I soon began to wonder,"Should I not just concentrate on one mantra instead of alternating back and forth?" My answer came in a dream over a month later on July 30, 2002. Last night, I was visited by Lord Skanda  my mother, father, guru, and god. In my dream, I found myself seated on a lush-green grass hill that oversaw small towns. It was day time and it was warm. I was wearing a veshti and a rudraksha necklace, the one I do japam with. Suddenly, my attention was drawn to the sky. In front of me, at a distance, was a beautiful rainbow. Having read Sri Skanda's Lessons, I immediately closed my eyes and said Sri Skanda's Mantra. Immediately after I said Sri Skanda's sacred mantra, I heard giggles coming from beside me. I quickly turned away from the sky towards my left. Seated beside me at very close proximity, was a little boy (Lord Muruga?) wearing glittering jewelry, which included a swarnabandan and gold necklaces. He had shoulder-length dark hair, sparkling white teeth, fair pinkish skin complexion, and glittering eyes. He was so pretty and handsome that I almost thought the boy was a girl! He was wearing the sacred thread (poo-nool), and a white veshti (dhoti) worn "brahmin-style." As He sat on my left, He then pointed towards a direction and asked [in English],"What is that?" When I looked in the direction that He pointed to, it was another rainbow, just like the one I saw earlier. The only difference was that the rainbow looked like it had been painted by the invisible hand of God. I saw it come alive from a small arc and span across the sky. In the process, I saw small magical stars that were glittering. These small stars preceeded the growth of the rainbow. So seeing this magnificent sight, I again said Sri Skanda's Mantra. Then Murugan(?) pointed in another direction. When I glanced that way, another rainbow miraculously appeared! So, I recited Sri Skanda's Mantra again. Lord Muruga(?) started to laugh because I kept on seeing more and more rainbows in the sky - and all I kept on doing was reciting His mantra over and over again! 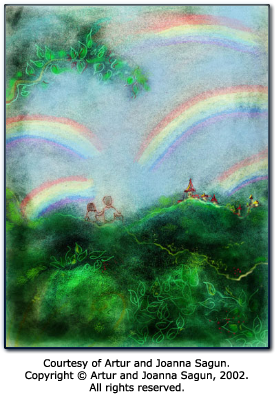 The rainbows finally faded from the sky and when I turned back to the boy, I noticed His pretty and what I call, Lord Murugan's "signature-smile." He has the same dazzling and beautiful smile each time He appears in my dreams. This is the main way I am able to recognize him. Mind you, throughout my dream, I had no idea who the boy was nor did I want to guess. Actually, I couldn't guess since I did not have enough time to think as Lord Murugan kept on creating rainbows out of thin air and hence, I was preoccupied with reciting the mantra. But when the rainbows disappeared from the sky, I looked at the beautiful child seated beside me and again saw His beautiful smile and thought,"Could it be [Lord Murugan]?" Immediately, the boy laughed and faded into thin air! I then continued saying Sri Skanda's Mantra over and over until I awoke. My Lord, thank you for coming and blessing me. As my SatGuru, you not only bestowed me with the gift of your mantra, but also initiated me with it by making me recite it over and over again. You also answered my question as to which mantra I should do japam with. Thank you also my Lord, for coming and testing me. Through this dream, you have also tested to see if I am able to put into practice the knowledge acquired from reading your Divine Discourses. In fact, the Skanda Mantra was given in Skanda's very first lesson (Lesson 1: Bridge of Rainbow Light), where He initiates disciples with His sacred mantra. But, Lord Skanda, through His infinite compassion and love, decided to personally initiate me with His mantra. My dear God Skanda, please continue to bless, guide, and protect your child with your nurturing and unending grace. Your leelas serve only to increase my faith and devotion to you, as I strive each day to attain your holy feet.